There’s a certain dependable niceness about Kevin Alan Milne’s storytelling. You understand that there will be upset and dissent, perhaps some confusion. But no one will spend a year tortured and locked in a mountain cabin and if there’s any blood at all, it won’t be the sort that’s cheaply spilled. And you won’t need to skip ahead to see how it all turns out as you can be confident that there’s to be a happy ending. Now some people will read that paragraph and feel disdain or despair. Those are not the people who should read Kevin Alan Milne, a writer whose books are very like chick lit so gentle it’s cozy -- without any real mystery -- and yet written by a man. 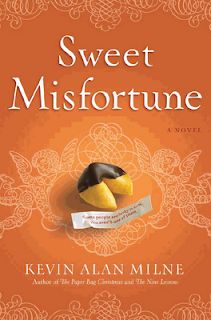 Sweet Misfortune (Center Street) is Milne’s first novel of full length, though two novellas (The Paper Bag Christmas and The Nine Lessons) have done very well. In Sweet Misfortune we meet Sophie Jones, a woman whose misfortune-filled life has left her with one big success: a chocolate shop, Chocolat’ de Soph, where she turns her misery into all-out creativity, concocting wonderful desserts. In a frenzy of inspiration, she creates a a line of chocolate dipped fortune cookies filled with cynical messages like “You will soon fall in love. Caution: when people fall, something usually breaks.” Despite this negative note, the cookies are big hit with her clients. They are less of a hit with her ex-finance, though. And when he would take issue with them, Sophie challenges him to show her sustainable happiness. If he can, she’ll entertain giving him a chance to explain why he inexplicably broke up with her the year before. Surprises and illumination result. This is a sweet, predictable and gentle novel. Author Milne lives in Oregon with his wife and five children. One imagines them walking around holding hands and singing at inappropriate times. That is not necessarily a bad thing.